We all know I'm a sucker for a great photo and what better time to pick up your camera and make some memories than while you're outside having fun in the sun? Once you've immortalized those moments forever, be sure to check out Shutterfly's latest photo contest: Long Live Summer Facebook Photo Contest. Enter to win a trip for four to The Bahamas (yes, please!) and a professional photo shoot so you’ll remember your vacation forever. All you need to do is upload your favorite photo and caption based on the theme of the week. Get a gift from Shutterfly just for entering! You can enter at any point during the 5-week sweepstakes period. This week's photo theme is: WATER FUN. 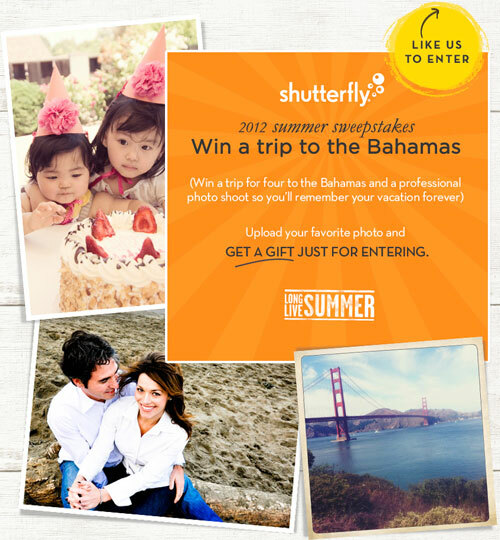 Official Rules of the Shutterfly Sweepstakes can be found here. for a free 8x8 hardcover photo book for composition of this post.